The Gray Diagnostic Reading Tests-Second Edition (GDRT-2) for ages 6 through 14-11 has been revised and updated to reflect current research in reading. 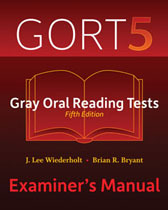 Ages 6-0 through 18-11 The GORT-5 yields information about oral reading rate and accuracy, oral reading comprehension, total oral reading ability, and oral reading miscues. This norm-referenced test for ages 3-6 through 8-6 assesses children's mastery of early developmental reading skills. Ages 9-0 through 17-11. 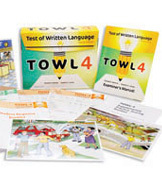 This norm-referenced, individually administered instrument uses both essay formats and traditional test formats to assess aspects of written language.